Personalized laptop bags blend flair and functionality. Sporty look with up to date fashions. 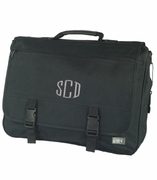 Monogrammed notebook computer bags are light and compact for the individual on the go. Attractive monogram tablet bags with adjustable straps for comfort. Embroidered computer business tote bags for stylish women for work or play. Unique style for traveling from home to office. Computer bags that reflect an individual personality and style with the geek chic fashion look. If there is one thing about modern life upon which we can all agree, it is that most of us are completely dependent on our computers. Even if you don�t work in an environment that requires you to use a computer regularly, chances are you will still find the odd opportunity to go online, surf social media, or just do some shopping. At Simply Bags, we understand that your embroidered laptop or tablet is probably as integral to your life as is oxygen or water, and as such, we want to help you protest it in style. 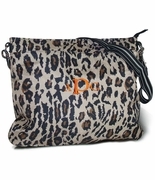 Our personalized laptop bags are the perfect blend of style and functionality. Whether you are into a sporty look, something a little more frilly, or just after something basic and sturdy, Simply Bags will have a laptop bag for you. From our monogrammed notebook computer bags like the Personalized Tablet Crossbody Tote to our iPad cases and monogram computer briefcases, all of our computer bags are light and compact for the individual on the go. 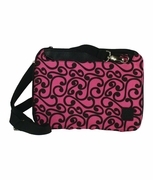 At Simply Bags, we put a lot of thought into the design of our computer bags; many of our bags have an adjustable shoulder strap for comfort, or can be easily slip inside another, larger bag for easy access. 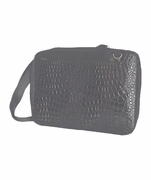 With a full range of materials and patterns available (from faux croc to nylon, quilting, and beyond), we at Simply Bags are confident that we have something to suit just about everyone�s tastes. With most of our computer bags, personal monogramming is available with either a one to three-letter monogram or name. At Simply Bags, there is no minimum order size, and our bags make excellent gift items, so if you have an upcoming event that you think one of our personalized computer bags would be suitable for, drop us a line, we�d love to hear from you.